Kotletto Premium WordPress Theme is a fully responsive, feature rich and beautifully designed WordPress theme for recipes related websites. 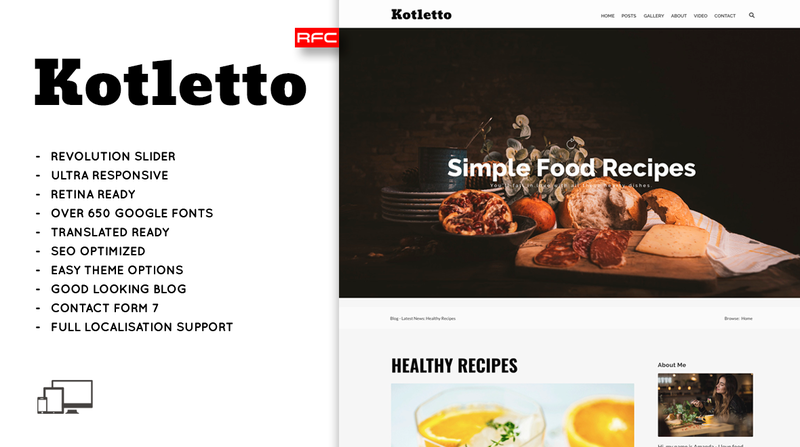 Kotletto Premium WordPress Theme is a delicious WordPress theme for those who love blogging about recipes and cooking. This theme is perfect for professional Chefs and Cooking Experts. Show your best recipes from your Instagram. Kotletto Premium WordPress Theme gives you a lot of useful and interesting features which make your work easier. Built with HTML5 & CSS3, Kotletto Premium WordPress Theme can be used for any type of website: News, Blog, Minimal, Personal, Magazine, Newspaper, etc. Unlimited colors and more than +650 Google fonts for your pleasure. It comes with demo content. Do you love cooking and recipes? Then this theme is for you. Start your tasty blog with a Kotletto Premium WordPress theme.